John Lennon’s songwriting was so visionary, his cultural impact so deep, that his guitar playing is often overlooked. 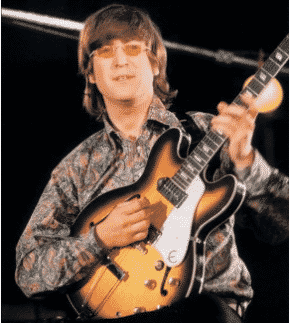 But lest we forget, it was with six-string in hand that Lennon changed the face of rock and roll. While he wasn’t the world’s flashiest guitarist, he was one of its most tasteful, tuneful and sometimes even terrifying practitioners. 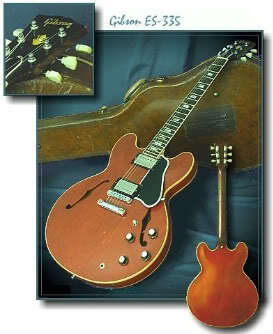 Two of the instruments immortalized by Lennon in his work with the Beatles and his subsequent solo career were his Gibson J-160E acoustic electric and his stripped Epiphone Casino. 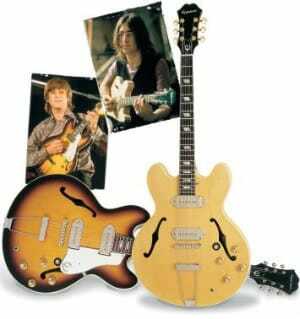 With the full cooperation of Lennon’s widow, Yoko Ono, Epiphone issued a series of limited-edition John Lennon Signature models based on these two guitars. 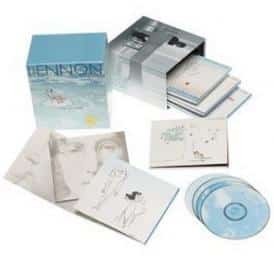 While these instruments may be collector’s items aimed primarily at the Lennon enthusiast, they are also reasonably priced, functional instruments, perfect for any working-class hero. Patterned after the Gibson J-160E acoustic-electric that were perennial Beatles workhorses, the signature model EJ-160E features an advanced Jumbo, sloped-shoulder body shape, solid spruce top, mahogany back and sides, a chunky solid mahogany neck and solid rosewood fingerboard and bridge. The impeccable fretboard is adorned with handsome “split parallelogram” inlays that are common on many Gibsons and Epiphones. The EJ-160E’s neck has the fat, rounded feel of many late-Fifties era Gibson electrics. A mini humbucking pickup is seated discreetly between the end of the guitar’s fretboard and the sound hole, while volume and tone controls are located on the guitar’s lower bout, as they would be on a standard electric guitar. Played acoustically, the EJ-160E has a meaty, midrangey tone that’s perfect for bold rock strumming and bluesy fingerpicking. Players who enjoy the crystalline high-end ping controlled low end of many “boutique” acoustics may find this guitar lacking subtlety or definition, but if you’re looking for that meaty, woody acoustic tone that gives so many Fab Four tracks their characteristic punch and warmth, this guitar is an ideal choice. 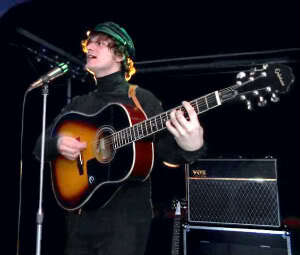 Perhaps because of the hefty girth of the neck, which is big enough to have it own very lively resonance, this guitar has a responsive rumble that lets the player feel the energy of every not, and playing it rivals the satisfying, bone-tickling experience of getting it on with a high-ticket Gibson J-200. Plugged through a blackface Fender Super Reverb, this instrument delivers a full yet clear sound that is only enhanced by the tone-fattening proximity of the pickup to the neck. And while the tone and volume controls don’t have that versatility of the graphic equalizer and feedback-notch-filter layouts found on many more “modern” electric acoustics, the controls are intuitive, effective and easy to grab on the fly.